PORTLAND, Ore. — Teachers across Oregon warn that disruptive behavior from students has reached a crisis level in our classrooms. This week a group of eight elementary teachers from around the Portland area told harrowing stories of commonplace violence and outbursts to KGW’s Cristin Severance. The frequency of the outbursts has left teachers wondering if they can provide a safe and inclusive learning environment. The report outlines recommendations on how to help students and teachers have a safer and more productive learning environment. The recommendations focus on things from smaller class sizes to addressing mental health and steps that can be taken at the lawmaking level as well as the classroom level. “There is something inside a person that says maybe this is my fault. Maybe I just need to be better and it comes down – it’s not that person’s fault,” said John Larson, president of the Oregon Education Association, Oregon’s largest teacher’s union. The report points to class size as an issue in many schools. The union reported that 579 classrooms across the state have 56 students or more. Additionally, 40 percent of classes statewide are at least one-third larger than the recommended size for the grade level. With classes that large, it’s difficult for a teacher to deal with a student going through an emotional outburst. “When you have three or four deregulated students, in a single classroom it’s nearly impossible to control the classroom behaviors,” said Larson. Class size isn’t the only factor contributing to the crisis. The report suggests that traumatic experiences for children, such as poverty and food insecurity, can cause a disrupted learning experience for that student. 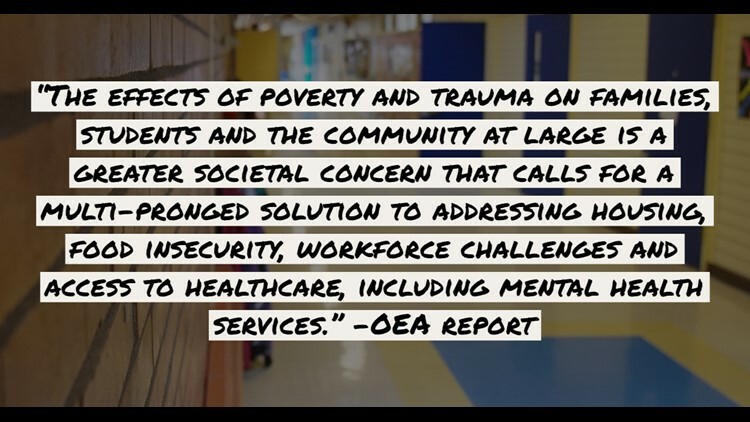 The report suggests that “wraparound” care, or programs that assist students and families in the community, be worked on at a state level. In creating more programs, earlier on for students and families to ensure their success, the student will be more likely to succeed. The union also suggests that districts hire more mental health professionals in schools, as well as adding an aide to any class larger than 22 students. “There are just not supports in school. We need calming rooms, we need physical space with tools to de-escalate students and then tools to work with them how to act in a social situation,” Larson said. In Beaverton, the recommendation for ‘calming rooms’ has already been implemented. Several elementary schools in the district have calming areas in classrooms where students can go to prevent an outburst. The district also has specialized staff members to help kids better learn social and emotional coping skills with specialized staff who are dedicated to the success of students. “We’re really trying to help those students develop regulation skills. We want them to become self-regulators so that they’re not always relying on adults to tell them when to breathe or when to call down but they’re recognizing in their own bodies when they need to regulate,” said Angela Healow. She is a teacher on special assignment in the Beaverton School District who works with students on building better emotional skills. These calming spaces are spaces that students can use with staff to help them identify issues and self-regulate before the outbursts occur. There are sensory items for kids, spaces where they can draw, color, and exercises that help them to learn how to regulate themselves. “It is a problem that exists in our schools but really it comes to our schools from our communities,” said Healow. 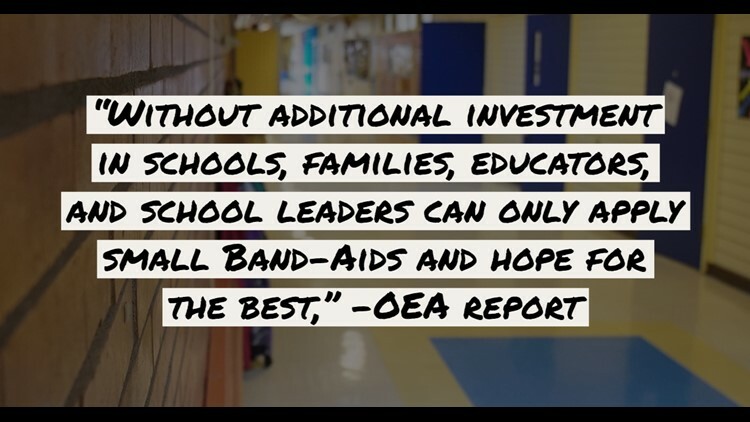 The OEA’s report does not isolate one cause or one solution to the classroom crisis but agrees with Healow’s sentiment that addressing the issue within schools and in the community is a way to tackle it. It suggests that state education agencies provide support for high0quality and professional development and retain more student support with a focus on mental health and support families and parent engagement and resources. Lastly, it addresses districts and buildings and the ability to encourage administrative leadership on the issue, loosen overly prescriptive academic mandates, ensure consistent and clear communication on school and district policies and to work with not only students but families and educators.